Buffet restaurant Zest of the newly opened Conrad Seoul in Yeouido, central Seoul, offers international delicacies from the four open kitchens. 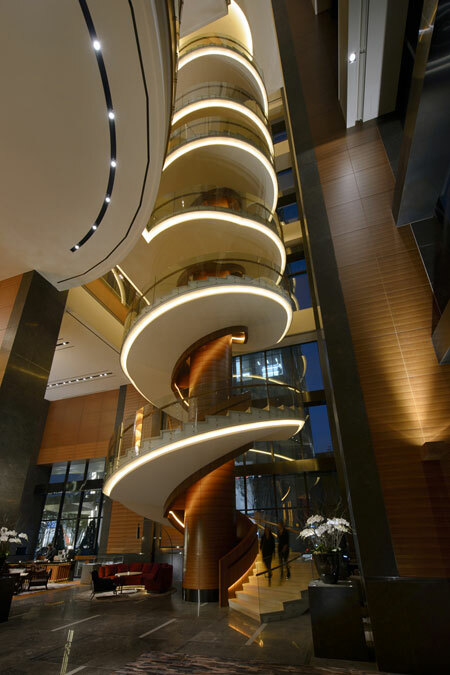 Conrad Seoul, the most luxurious brand of Hilton Worldwide, has opened in the heart of Yeouido, the financial center of the nation's capital. Based on the concept "Smart Luxury", the five-star hotel began offering services on Nov. 12. It is a 38-story building, one of four towers in the International Finance Center (IFC) Seoul, the first large-scale multipurpose commercial venue in the district. "As we have adopted the brand new concept of Smart Luxury look out for all our 434 guestrooms and suites, restaurants and bars, ballrooms and health club and spa; we have also gone to great lengths to ensure that the comfort and enjoyment that you have experienced so well at all our 20 Conrad hotels and resorts around the world remains, and in fact, we promise you that it will be even better," said Nils-Arne Schroeder, general manager of the hotel, in a media briefing on Nov. 6. Regarding the new concept, the hotel explained that Smart Luxury doesn't means something high-end and eye-popping but involves helping guests experience local culture in comfortable ways and at the same time connecting them with their own world, i.e., family and friends. "Hotels now are more than just places that offer comfortable bedding and an efficient business environment. Guests want to be connected with their colleagues, family and friends. We realize this connectivity through smart TVs in the guestrooms," Jean Park, marketing communications director, said. As the first hotel to do so in Korea, Conrad Seoul offers an all-in-one multimedia hub using Apple-based technology, enabling guests to surf the Internet, access Facebook or play with personal content on their own iPad, iPhone, other devices or laptops on the 42-inch television. "At the same time, guests want to communicate with local people in the country they are visiting. Our workers have many multinational experiences that can help them," Park said. Another factor which the hotel says differentiates itself from other hotels is flawless service. Hotel inspections for journalists on Nov. 6 showed how perfectly the hotel prepared offering a glimpse of the efforts it will make for its guests. What first captures the eyes is the 36.5-meter spiral staircase which starts in the lobby and reaches up to the fifth floor, connecting the second and third floors. Each of Conrad Seoul's 434 guestrooms and suites is equipped with state-of-the-art facilities, including multimedia systems. The hotel also boasts spacious rooms. The size of the basic rooms is 48 square meters while the penthouse is 288 square meters. Products by British spa brand Aromatherapy Associates are placed as in-room amenities. The hotel has three restaurants and two lounges: the 37 Grill and Bar and the Executive Lounge, located on the 37th floor, guarantee a breathtaking 360-degree view of Seoul, including a panoramic view of the Han River. An Italian restaurant, Atrio, offers spacious ambience with a 28-meter-high ceiling, while the three-course buffet restaurant Zest presents international delicacies from four open kitchens. The Flames is a lobby lounge for snacks and beverages. For conferences, weddings or other large-sized occasions, two ballrooms are prepared: the Grand Ballroom on the fourth floor can accommodate a banquet for 800 people, and up to 1,000 if utilized for a theater performance. The Park Ballroom on the fifth floor has capacity for 400 guests. Called the "Studios," 11 meeting rooms are located on the sixth floor. Each of the rooms has windows that let in natural daylight, and residential-style kitchens are in the center of the floor offering unique food and drink. Another special feature of Conrad Seoul is the fitness club on the eighth floor, named Pulse8. With state-of-the-art equipment, the gym is open 24 hours a day, seven days a week, and also has a 25-meter-long indoor swimming pool, and seven golf driving ranges. On the ninth floor is a spa with eight treatment rooms, each of which has a treatment facility, shower booth and a toilet to guarantee privacy. The hotel is directly linked to newly opened IFC Mall which has a variety of eating, shopping and entertaining options, as well as access to subway lines Nos. 5 and 9. 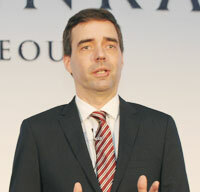 Schroeder said Yeouido may not be a tourist destination but is a domestic financial hub that has great potential. "It (Conrad Seoul) is part of the IFC mixed development project, which also houses three corporate office towers as well as retail outlets. With the opening of the Conrad Seoul, it is expected that we will become the city's main confluence for commuters, shoppers, delegates and diners every day. Many of these guests will find Conrad Seoul to be an ideal venue for meetings or a place to catch up with friends." He also pointed out that Korea is not only a leisure destination but also a good place for meetings. "It continues to be a fantastic meeting destination. The G20 and the Nuclear Summit have actually helped put Seoul on the map for many conventions to come. That's an additional opportunity for all of us." The general director said the 500 staffers are one of the strong points of the hotel, adding that they are fully prepared to serve guests. "In January we sent 10 of them to Conrad in Singapore and made them fully understand the international hospitality, and that's what we are really proud of. My team, that's something which makes us different compared to other hotels in Korea," he said.